Could you make the play button move as we scroll up and down? I was wondering if it was possible to make the “play lesson” button move as we scroll up and down in the lesson. I often find myself reading the dialogue while I’m listening to the lesson, scrolling up to pause the lesson, and then scrolling back down to continue reading that particular paragraph. Basically I would like to be able to pause the lesson at any time, whether I’m looking at the vocabulary list or reading the dialogue, without having to scroll back up and hit pause. Include a key to pause the lesson? This is a good suggestion. I have let our team know about your idea and we’ve added it to our list of enhancements. However, we have bigger priorities right now so it might be some time before we can try to implement it. But I’m not the one who would like it haha, when you are listening and the conversation is going to fast, you just want to make a break I order to get everything . LingQ I really hate it… Maybe because I didn’t spend so much time and didn’t try so much but the website is hugely , not easy to use, the lesson are boring and strange that everyone can give some lesson ( but you still need to pay). 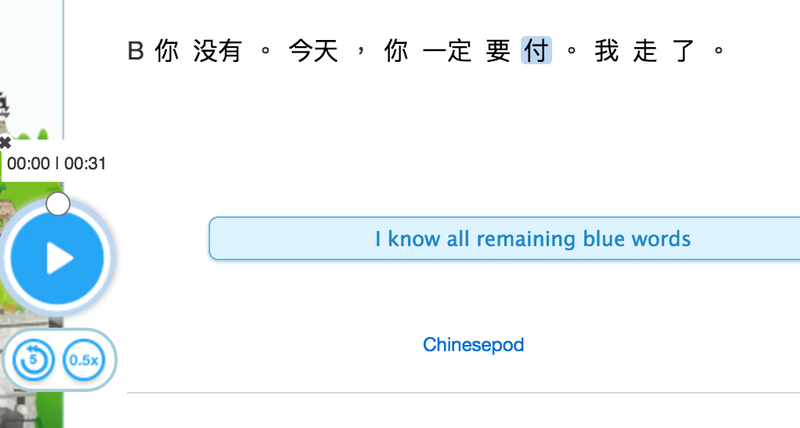 It’s making it really chaotic… Definitively I prefer to learn with chinesepod. Exactly. The player button scrolls with you, so you can pause the lesson at any time no matter where you are. No problem, take your time. Thanks for everything! I definitely support this idea. Especially on Upper-Intermediate or Above lessons, when the dialog gets long, we would scroll down the dialog as we listen. But it’s quite annoying to have to scroll all the way up to pause. The result is that we would always pause it a bit too late than at the real pause point that we want. Hopefully you will implement this sooner rather than later. Maybe this went to wherever good ideas go to die, but people are still asking for it. Maybe my clunky workaround would actually work for some of you: Include a key to pause the lesson? One change I’d like to see is for the dialogue individual line play button moved away from the download button. Ditto for the expansion play buttons. I like to play expansion audio before reading the pinyin to see if I can figure out a phrase. It’ disruptive hitting the download button by mistake. Also, the floating help button sometimes is in the way of the play button when I practice this way. There’s no way to hide the help button. Thanks!